Home / Lipa / Look Ma They’re Selling Football Jerseys in Lipa! Look Ma They’re Selling Football Jerseys in Lipa! Not just in the malls, mind! Even in a few clothing shops uptown. Now, who would have thought? If you’re wondering why I think it is such a big deal, well, because it is! For the longest time, if you went on a round of the clothes shops uptown, more or less a staple of the shops would be a wide assortment of NBA replicas: Lakers shirts; Celtics shirts; Bulls shirts. Plus an equal number of those pyjama shorts that basketball players oh-so-love to wear. Football jerseys? Strictly speaking, replica shirts. Once upon a time, even in the big malls of the Metro Manila, these were next to impossible to find. They were so rare that even badly-made jerseys went for almost a thousand pesos. And local football players, starved for memorabilia as we were then, bought them. Well, they did! I didn’t because I didn’t think they were good value for money. Although my coaching was mostly laced with the pass-and-move philosophy of the club that I support, unfortunately the onset of the cable television era meant that many of the boys that I coached also grew up watching the arch-enemy. But when I went to Thailand in 2000, I filled an entire suitcase with 30 or so replica jerseys, most of them just for myself. The conversion rate of the peso to that baht at the time was practically one-to-one. A passable replica jersey went for as low as 150 baht. Add another hundred baht and you would not be able to tell the replica from the original. I was so happy that I bought replica jerseys of clubs that I did not even support. Tottenham Hotspur. Leeds United. Barcelona. Except one club, of course! Guess which one! Albeit, there will be no prizes for guessing. 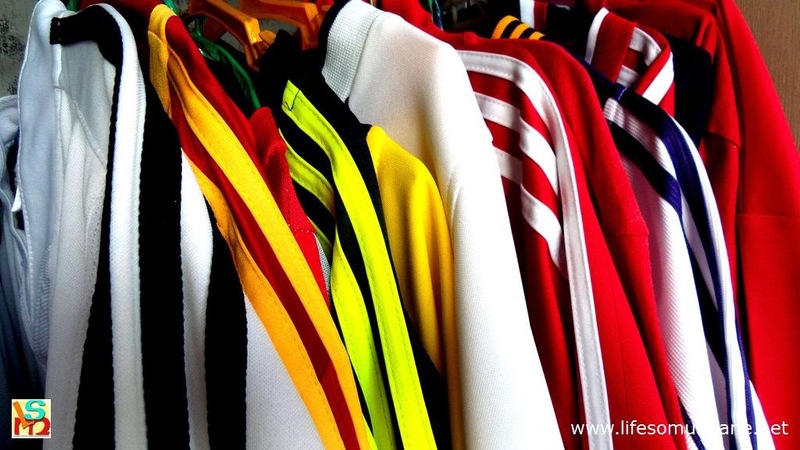 This club’s jerseys were ubiquitous all over Bangkok; but I wouldn’t touch them with a ten foot pole. Our Thai guide asked how much I paid for one jersey. When I said 150 baht, she snorted. To her, it was expensive. To me, of course, it was cheap – especially in comparison to the bad replicas they sold in the malls back in Manila. Of course, from the time the Thai Airways left the Don Muang in Bangkok all the way to when we landed at the NAIA, I must have cooked up a thousand excuses inside my head to convince customs if they accosted me that I was not smuggling jerseys into the country. Thankfully, Philippine customs just waved me through. There are, indeed, advantages to not only NOT being rich but also not looking rich. So, back to jerseys now being sold in Lipa. Spares me a round trip to Bangkok, at the very least. Remarkably cheap, too! They can go for as low as PHP 200 inside the malls and PHP 180 in the shops uptown. While they are nothing like the originals, they are not bad imitations, either! Of course, on the down side, the availability of the jerseys means that it is not uncommon anymore to see faceless little men wearing these all over the place. Tricycle drivers, even. No, I am not making this up! I once saw one wearing a Barcelona jersey. How annoying is that? It’s annoying not because they are wearing the jerseys; but more that these are the sort who are certain to be totally clueless about the significance of the jerseys that they are wearing. There was even one time when a basketball player friend was proudly showing off his brand new Chelsea jersey. Being me, I could not help asking him if he even knew the name of the team whose jersey he was wearing. Forgive me for being so mean, but I am so old school in these things. Ideally, one buys the jersey of the club that one supports as a gesture of affinity with the club and to show one’s loyalty. Of course, it’s a free country and the forces of the market economy have simply taken over. If there is something that annoys me the most, however, it is when football players that I myself coached are just as clueless as kanto boys who buy jerseys for the design and the colour. I have lost count of the number of times that I have told some of them that if you are a United fan, yes, you wear United jerseys. But you do not – repeat, NOT – wear Liverpool jerseys! I think the Liverpool jerseys were just to appease me. Well, you boys can buy your United jerseys uptown because there are plenty of those in the shops. While I happily watch Luis Suarez banging in the goals, wearing the red jersey that I bought for 200 pesos!